In this article about Joel Kaplan, the latest Jewish appointment to the Bush White House, we learn that Chief of Staff Josh Bolten not only dated Bo Derek but also recited the Sheva Berakhot at Joel Kaplan's wedding earlier this year. Apparently, the new Deputy Chief of Staff also fulfills the mitzvah of lulav each year at the White House. While Bolten and Kaplan appear to be the first one-two punch in the White House as Chief-of-Staff and Deputy Chief-of-Staff respectively, they are certainly not the first Jewish appointments for George W. Bush. In addition to Scooter Libby and Paul Wolfowitz who are both Jewish, Michael Chertoff (Secretary of Homeland Security) is the son of a Conservative rabbi. We also cannot forget about Bush's former Press Secretary Ari Fleischer. Here's the complete list of Jewish members of the Bush White House. Here is part of the article from the JTA.org. The complete article is here. WASHINGTON, May 8 (JTA) -- Joel Kaplan, President Bush's new policy czar, brings to his job a disciplined adherence to the White House message. Bush last month named Kaplan, 36, as deputy chief of staff in charge of day-to-day policy after deciding that his closest adviser, Karl Rove, needed to focus more on upcoming congressional elections. With Bush's public support plummeting in opinion polls, Republicans face the real prospect of losing one or both houses of Congress in November. Kaplan's reputation after three years as deputy director of the Office of Management and Budget was of someone able to simultaneously handle the big picture and master details - qualities that made him a good fit for one of the most grueling jobs in the administration. "I tell everyone that you really have to have your stuff together before you go and meet with" Kaplan, said Tevi Troy, a senior adviser to Bush who was the White House liaison to the Jewish community until 2003. "He has a reputation for brilliance and really getting to the heart of the matter." Kaplan seemed both a natural choice for the policy job and something of a mystery. It seemed natural enough for Joshua Bolten, Bush's new chief of staff, to bring over his most trusted aide from the Office of Management and Budget, where Bolten had been director. Bolten, who also is Jewish, recited the Sheva Brachot, traditional Jewish blessings, at Kaplan's wedding earlier this year at the National Museum of Women in the Arts. On the other hand, Kaplan was an unknown quantity -- unlike Bolten, who was known for his friendly relations with Congress and his onetime dalliance with Hollywood star Bo Derek. Kaplan has made his presence felt in the new post with an easygoing manner. "He has a lot of energy, a good sense of humor," said Jay Zeidman, the White House Jewish liaison. That sense of humor sometimes gets a little goofy. 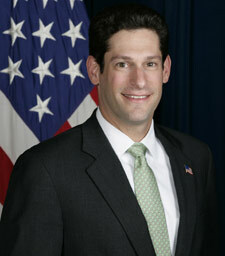 In a January 2004 online session of "Ask the White House" on the topic of the budget, Kaplan showed an apt hand with statistics and projections, answering a question in heavy policy-wonk jargon. Yet when someone asked Kaplan about his resemblance to Peter Frampton, he immediately posted a photo of the 1970s rock icon and said he had just bought a shirt like the silk number Frampton is wearing in the picture. "As for my favorite Frampton song -- I would go with 'Show me the Way' or 'Day in the Sun,' " he added. [...]Jones said Kaplan wanted to break away for a while from his middle-class upbringing in suburban Boston, where he attended Sunday school at Temple Beth Elohim in Wellesley, Mass. "We were graduates of liberal arts schools from the Northeast, a Jewish guy and a black guy," said Jones, who now is a partner in a venture capital firm in the Washington area. "It was not your typical demographic, which is why we both did it -- to get out of our comfort zone." Old friends say Kaplan's seriousness stems in part from his Jewish commitment. Kaplan maintained his connection to his faith even while leading patrols on the U.S.-Mexico border or fighting wildfires in Washington state. "We spoke about religion on a number of occasions," said Brian O'Leary, who trained in artillery with Kaplan in Oklahoma and now is a money manager in New Jersey. "He's very astute with respect to his own faith." Kaplan participates avidly in White House Jewish events, seeking out the rabbi in attendance on Sukkot to fulfill the mitzvah of the lulav and etrog. Most recently, he spoke at the executive office's private Holocaust remembrance ceremony. "He spoke eloquently and thoughtfully" Zeidman said. "He carried the message of the importance of never forgetting." Jones said Kaplan's Judaism is an essential part of his worldview.